Iconic painting by Pablo Picasso, created as response to the Spanish Civil War bombing of a Basque Country village, Guernica. Commissioned by the Spanish Republican government, Picasso created a large mural inspired by the killings in northern Spain for the 1937 World's Fair in Paris. Abstract art vector illustration of a famous painting. 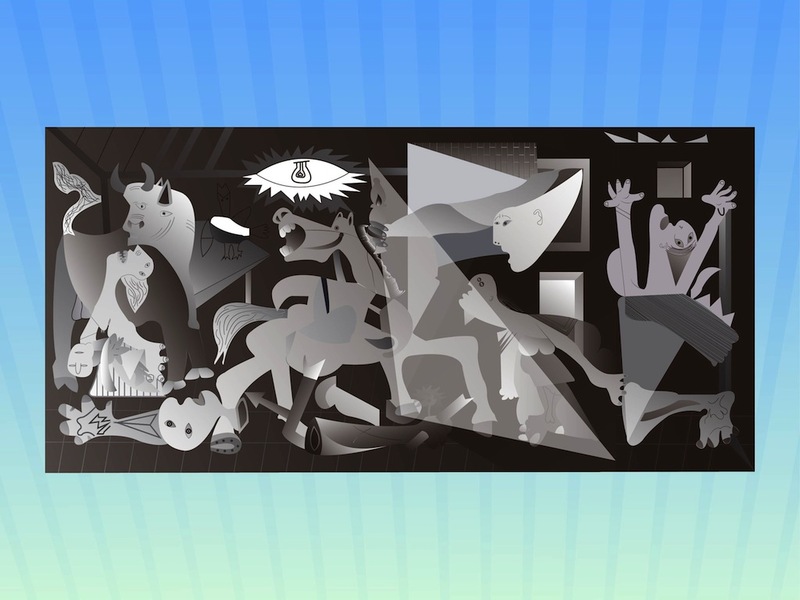 Illustrator versions of the artwork Guernica by Picasso. Greyscale illustration with abstract illustrations of people, animals and everyday objects. Free vector illustration to use in your art history, famous painters, masterpieces and influential paintings projects. Tags: Art, Attack, Bomb, Bombing, Painter, Painting, Picasso, Tragedy.